This amazing pole tent is built strong for the multiple set ups of commercial or industrial use. The top is made from "Block Out" 15-oz. vinyl that comes in solid white or white with translucent colored stripes. The canopy's perimeter is reinforced with 2" seatbelt and the top comes with "guy ropes" attached and ready for assembly. All center and quarter poles have welded plates on top and bottom with a heavy-duty pin welded to the top. The top and sidewalls (if ordered) come in storage bags. The complete package includes all necessary poles and stakes as well as the top, storage bags, and an installation video. A 1-year manufacturer's warranty applies to this item. Is the inside of this tent dark? I need it to be dark inside as we will be showing movies inside. This is a vinyl top so it will block quite a bit of light but it will not be very dark without the addition of a complete sidewall enclosure. Can I see the interior of this? I need fewer poles as I am doing a moving dinosaur performance. With a pole tent, you cannot remove poles or it will compromise the stability of the tent. We suggest that you select a Frame Tent. 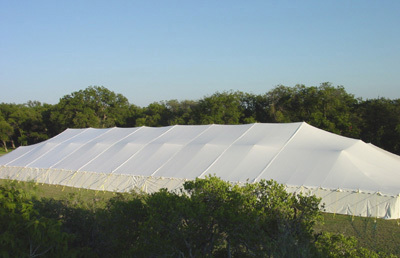 Frame tents do not use middle poles and leaves the entire interior of the tent open and free of obstructions.